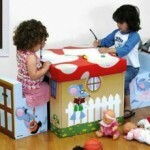 Home » KROOOM ~ Bright, Strong, Lightweight, Foldable Kids Furniture! 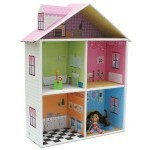 What could be better than strong, lightweight kids furniture decorated in bright, kid friendly designs? 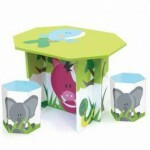 That same furniture made from high end cardboard, resulting in environmentally friendly kids furniture that folds flat! Founded in 2006, KROOOM has brought innovative new products to the kids furniture market! Their special Patent Pending construction technique results in a product that is easily assembled without the use of tools, has absolutely no cardboard edges showing at the sides, provides greater moisture resistance than other cardboard products, has outstanding strength and stability and still folds flat! The KROOOM kids line features storage boxes and chests, dry erase boards, stool and table sets, book cases as well as a fabulous collection of dollhouses, including a castle and fire station. All of this made from laminated recycled cardboard!